Sell out supper clubs with Berlin’s Stone Brewery and XO Kitchen; appearances at Chow Down and Vegan North. What next? Well, there’s Knaves Kitchen’s first vegan junk food Christmas menu, but before that, there’s Halloween/World Vegan Day. O! And of course New Year’s Eve. 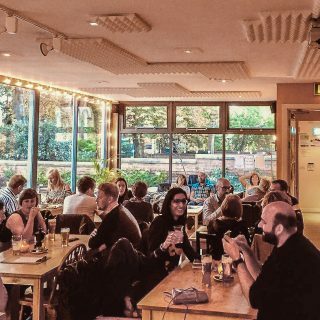 Not yet a year old, Knaves Kitchen was launched as part of Oporto and has gained recognition for its inventive vegan fare, available at all hours of the day. On 1 November, to celebrate Halloween and World Vegan Day, Knaves Kitchen is offering five Halloween themed vegan dishes and five specially created Oporto cocktails and themed drinks paired with them all for just £31. There are prizes for best fancy dress. On New Year’s Eve, we move from fun to sophisticated (and fun!) Guests will have their table for the evening and be welcomed with vegan bubbly. Top DJs will provide the music – and a few surprises will be thrown in – during a three-course vegan celebration for just £29.95pp. The Christmas menu will be served from the 1st of December and features dishes like Christmas Wurst and Parsnip Bacon Bun, Boozy Shallots, Root Hash and Lambs Lettuce Truffle Crunch, Peruvian Jack Fruit Ceviche, Corn Croquettes, Sweet Pepper Aji and Yorkshire Seitan and Wild Mushroom Wellington, Rosemary Roasties, Mulled Cabbage, Buttered Greens and PROPER Gravy. There are more!